Eight months after smashing individual and team pursuit records, US riders Sarah Hammer, Lauren Tamayo and Dotsie Bausch have received notice from the UCI that the new world standards have been officially ratified. A letter sent yesterday from cycling’s governing body to Sean Petty of USA Cycling confirmed the mark of 3 minutes 22.269 seconds set by Hammer on May 11th, over two seconds faster than the 3 minutes 24.537 set by Kiwi Sarah Ulmer on August 22nd 2004, during that year’s Olympic Games. Also ratified was the 3 minutes 19.569 seconds clocked up by the American trio one day later, on May 12th. They were competing in the Panamerican Championships in Aguascalientes, Mexico, and recorded a clear improvement over the previous world record of 3 minutes 21.552 as set at the world championships last March. This was achieved by the New Zealand trio of Shanks, Rushlee Buchanan and Lauren Ellis. Hammer’s husband and coach Andy Sparks said that her individual pursuit world record had been a major goal for her for quite some time. “So much work went into the preparation for Sarah’s individual 3K pursuit record after the World Championships that I would have been completely deflated if it would not have been ratified,” he told VeloNation today. “Breaking the world record was Sarah’s number one lifetime goal as a rider. Sparks also had a hand in building the team pursuit squad, and while he is currently no longer running that side of things, he also feels a sense of satisfaction. He told VeloNation how he got involved. 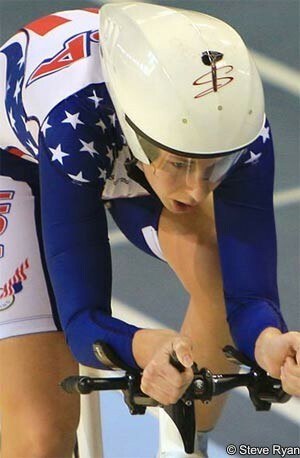 “USA Cycling Performance Director Jim Miller approached me to start the US women’s team pursuit program in 2006. At the start the program was designed to have a cross-pollination effect that would assist the road endurance women with a source for systematic hard training and power acquisition for the road. All of the great US women road riders took part in the program: Kristin Armstrong , Christine Thornburn and Allison Powers, to name a few, and most were never intended to actually race it. “January 2008 was the actually the first time we lined up a team and the time was a 3.31, which was great considering Sarah was not even part of the team as she was out with her back injury. What makes the records all the more rewarding is that Hammer had been suffering with a back problem for several years. She worked with various specialists including massage therapist Doug Thralls, whom she paid particular thanks to after winning gold at last year’s worlds, and also made some equipment and bike position changes. She’s clearly got back on track. He is the coach to the Irish team and this has actually been something which has worked out well. “Sarah trains with my Irish squad now and that really helps bring up the standard as she exposes them to a high level of focus and work ethic, and also to the commitment and standard needed daily to achieve results at a world level. Sarah is having fun with the new group and I’m hopeful my Irish riders are enjoying it as much as her. That’s still a year and a half away, though, and so Hammer, Tamayo and Bausch will savour their newly-ratified records for now and draw on them for motivation. Sparks sees one of the records remaining for quite some time, while he believes another could change sooner than that. “On the individual pursuit side, I think, and hope, the record is safe for some time,” he predicted. “That 3:22.2 was the culmination of a lot of work by not only Sarah and me, but also a lot of support and sacrifice by many others who have supported both of us on this journey. It is a great way to say thank you. Of course, Sparks will hope that if the record is beaten, it will once again be done by the American women.